There is blood. There is pain. And there is him. These are the first things I register when I wake up, the lone survivor in an Alaskan plane crash. He carries me to safety over rough terrain and brings me to his cabin in the woods. He has no name. Or none he will tell me. As snow creeps across the harsh and isolated landscape, he is my only company. My protector, my caretaker. A fascinating enigma, with mysterious eyes, gentle hands, and a rough voice that demands more from me than I ever expected to give. I make up different stories, different names for him depending on his mood, because I know nothing about him except that he is my only connection to the real world I want to return to. So I work to please him, plotting my escape, yet all while I start to crave him and every touch of his dominating body. He has saved me from the cold. From death. But in taking me and my body, will he destroy me? Where to start? 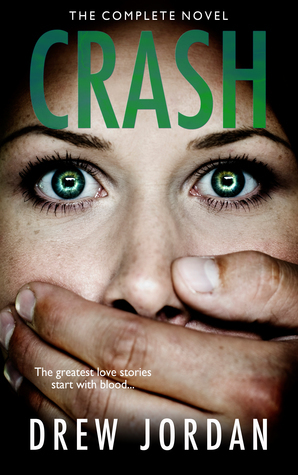 Crash, by Drew Jordan is one hell of a dark and thrilling read! I must warn you that it does end on a cliff hanger (an ending I did not see coming), but the good news is that the remaining books in the series have both been released. If you do choose to read this you will not have to wait for the sequels! Due to her injuries and the isolation of his cabin, Lainey is reliant on him for her basic needs and their relationship is one of control and dependence. Their relationship is therefore far from what could be described as normal. The ‘Stranger’ clearly has the upper hand in a big way ( a number of scenes make his this very explicit) and Lainey, although she comes to enjoy his touch, fears that she will never escape. As the story is narrated in the first person POV, by Lainey, the ‘Stranger’ is an enigma to the reader just as he is to Lainey. The reader can only surmise what dark deeds he may have committed in the past and what has led him to lead an isolated existence for so long. We learn little about Lainey, other than that she is a young woman striving to take control of her life. The focus of the story is mainly on the couple’s relationship. I read a lot of dark romances and there are some extremely twisted elements to this book. The ending blew my mind! I’m looking forward to reading the other books in the series to find out where Lainey and ‘Stranger’s’ extremely unorthodox story goes. Recommended for dark romance fans.